When it comes to color, it’s time for a FLASHBACK! In 2018 you’ll see your favorite color palettes from the ’60s, ’70s, ’80s, and ’90s pop up everywhere, including website design. “After so long investing in neutral colours… we’re seeing a resurgence in bright colours, illustrations and personality in all forms of design. The color trends — bubble-gum pinks and lemony yellows — of the ’50s gave way to hotter, deeper tones and shades like rust and gold. The following cover designs were both created for the same company. The first design, a peony pink with bright lemon yellow typography, was created in 1957. Just One More! magazine covers from 1957 and 1963. © Press Photographers Association of Greater Los Angeles. Famous pop artists of the time included Andy Warhol and Roy Lichtenstein. Pop art was one major art movement in the 1960s, and its impact on design can still be seen today. Pop Art introduced the use of commonplace objects and celebrities in art. This was a big deal in 1960, because art up to that time had focused on themes of morality, history, mythology, and other ‘high-brow’ themes. Pop Art turned art on its head when Andy Warhol started painting soup cans and actresses in psychedelic colors like hot pink and cyan. Roy Lichtenstein, Ohhh … Alright … 1964. © Roy Lichtenstein. Alexander Calder, Circle with Eyes, 1976. © Alexander Calder. Regarding web design, we’re seeing the classic ’60s psychedelic color scheme making a reappearance. Check out this website from Station, a design company in Switzerland. It uses a very distinct yellow shade for its homepage banner. The Station website design uses color trends from the ’60s in its banner. Top Pitch targets “the future leaders of fashion technology”, so its website better be the latest in design and tech. The homepage utilizes a fun paralax scrolling element to make the website come alive. The design is ’60s minimalist: white sans serif font against a deep orange (check out Calder’s work, above, to see the same shade). Top Pitch website design takes us back to the ’60s. 88 & 90 Lexington Avenue is a website from HFZ Capital Group, a real estate developer of luxury residential condominiums in Manhattan. The design uses ’60s minimalism, just like Top Pitch, and the colors blue (in this case, deep navy), red, and yellow. 88and90lex.com uses ’60s minimalism along with classic ’60s colors red, blue, and yellow, to catch the user’s eye. How the 1960s’ Most Iconic Artists Made Art Contemporary from Artsy.net, a resource for art collecting and education. Graphic artworks by Alexander Calder from Calder Foundation. Color trends in art and design the 1970s moved from poppy colors to more sedated earth tones. In contrast to the vibrant colors of the ’60s, the ’70s turned to nature for inspiration, embracing browns, greens, and earthy reds and yellows. Check out this example of photography by John Baldessari from 1973. John Baldessari, 1973, Throwing three balls in the air to get a straight line. This isn’t to say that colors used in art and design during this time were drab. This poster design from the 1976 Montreal Olympics goes full blown ’70s with a vibrant rainbow stripe against the silhouette of a beaver. The colors are bright and vibrant, much like the ’60s color palettes. Cornel Brudaşcu worked with energetic color choices, but balanced those colors with deeper, more somber shades. The colors used in Composition are reminiscent of those used by Warhol in his Marilyn works. Brudaşcu takes leave of Pop Art’s clean lines and diffuses his outlines and shapes to create a less distinct, more blurry image. Peter Saul makes a statement about culture in the work SHICAGO JUSTUS. He uses avocado green next to a warm chestnut edged in black. We also see the classic red, yellow, and blue color theme in this work. Atsuko Tanaka was part of the Gutai movement, and was known as a pioneering Japanese avant-garde artist. She uses dark earth tones (avocado, mustard, burnt umber) in her painting, Work. Like Alexander Calder, the Gutai movement used color, medium, and shapes to create beauty and movement. This type of artwork takes experience to another level. Experience, as modern web designers know, is key to good web design. Pioneering works such as those above pave the way for User Experience Design. You’ll see evidence of this earthy color scheme in many 2018 website designs, including corporate websites like Gibeon from Japan. Its website banner contains muted earth tones, with a rusty orange CTA (Call-To-Action; in this case, a button). Gibeon, a video production company in Sapporo, Japan, uses muted earth tones for its banner. The video banner gives way to a super-seventies-inspired layout and color palette. Geometric shapes, a charcoal background, lots of white space, and minimalist photography really capture the essence of the ’70s. Scroll down Gibeon’s homepage to find a color scheme inspired by the ’70s. Sky Zone pays tribute to the stylin’ ’70s with a rust-and-charcoal color palette and geometric shapes. UZUZ uses muted earth tones for a ’70s throwback feel. Get ready to PARTY!! Grab those leg warmers, turn up Madonna, and let’s rock out to the ’80s! The ’80s ushered in bold, happy colors, like those found on De La Soul’s album, 3 Feet and Rising, released in 1989. These colors were a departure from the more demure earthy colors from the ’70s. De La Soul, 3 Feet and Rising, 1989. Keith Haring uses black and white and red in the iconic 1988 painting, A Pile of Crowns, for Jean-Michel Basquiat. Keith Haring, A Pile of Crowns for Jean-Michael Basquiat, 1988. The Keith Haring Foundation, New York. Willem De Kooning once said, “The past does not influence me; I influence it.” Kooning painted in the style known as abstract expressionism or “action painting”. His work below uses shape, density, color, and perspective to create movement. A glorious ode to ’80s greatness is the Stroom website. This Ukraine-based company’s website design uses lavender and gray, a classic ’80s color combo, to capture attention and stand out from competitors. Even the product page, which professionally lists each electric car that’s for sale, is very ’80s. Yet the design remains modern with its intelligent use of whitespace. It’s clean, easy to read, and aesthetically interesting. Another website design that pays tribute to the vibrancy of the ’80s is Spallian, a French tech company. This website uses ’80s neon brights with soft-edged graphics to create an entertaining yet professional design. Neon colors are ’80s colors made modern in this website design. Rentberry’s design uses every purple shade in the color wheel on its website. The result? Soft, inviting, and definitely worth a look. Rentberry’s website design dives right into an ’80s color palette with mauve, lavender, violet, and orchid shades. The following website design for Poppers Coolers uses a range of purples and reds, cooled a bit with bright green and lots of white, gray and black. Scroll down the homepage to find information floating among the stars – the galaxy background gives everything an other-worldly feel. The Most Iconic Artists of the 1980s – from Artsy.net, a resource for art collecting and education. In Hannelore Baron’s Art, a Voice of Defiant Hope and Survival – from Hyperallergic, a forum for playful, serious, and radical perspectives on art and culture in the world today. The ’90s: think “Saved by the Bell” when you visualize this decade’s color palette. ’90s design was inspired by ’60s design. In the 1990s, yellow evolved into a muddier version of ’60s yellow. 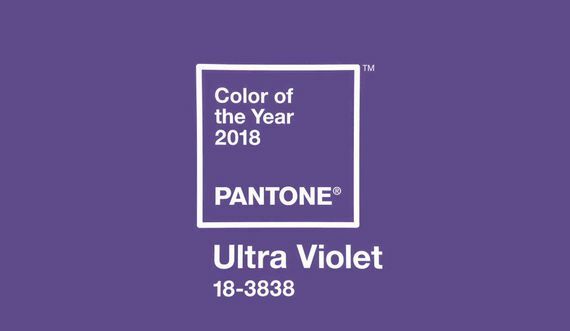 (Pantone colors below, used in the very informative 50 Years in Color Infographic). The idea of art in the ’90s can be closely linked to the idea of art in the ’60s. The ’90s saw an outpouring of many different styles of art. Compare Glenn Ligon to Pattsi Valdez. Pattsi Valdez uses vibrant colors to create movement and express feeling in her paintings. This website design’s scuba blue banner channels 1990s zen. Emblem uses pale green mint, bright lemon, and brick red to infuse playful ’90s colors into its website design. Lots of black and white adds substance to balance the overall feel of the website. If you design a website in 2018, keep in mind that COLOR is what’s hot. We’ve seen a range of colors used in website design recently, color palettes from several past eras, from the ’60s to the ’90s. It’s an exciting time to be a website designer. 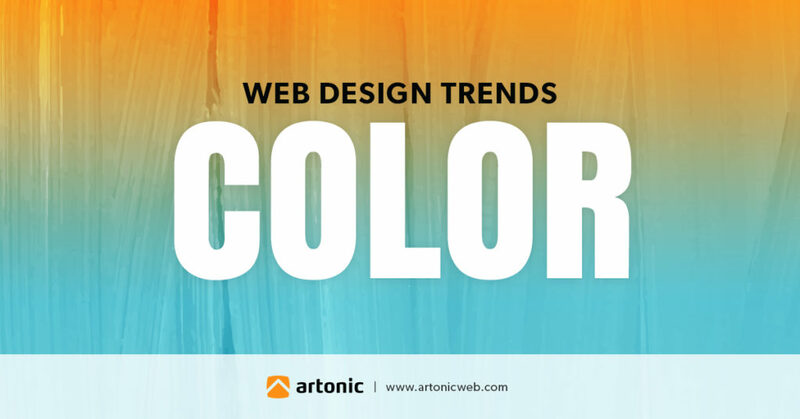 Color is an excellent tool to use in website design to create interest, movement, and engagement, not to mention beauty. Next Next post: 2018 Web Design Trend: Gradients & Gradients & Gradients, Oh My!